I thought I would send you pictures of my Hät Heavy Ambulance. I have added a pair of leading horses from a Hät six horse limber. I have also modified the harness system (as I do for all French vehicles). 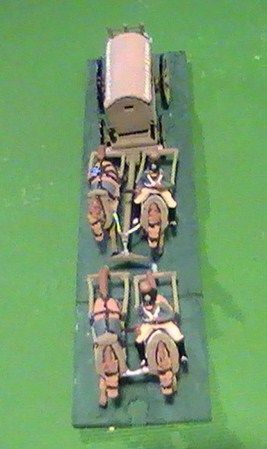 The Hät models have the leading horses in a four horse team connected to the vehicle shaft with the same single polebar. In fact the French system was always to use individual short bars (swingletrees) behind each of these horses (ie the leading pair in a four horse team or intermediate pair in a six horse team). This pair of swingletrees were then connected to a single transverse bar (whippletree) and thence to the end of the pole shaft. To model this I have shortened the pole shaft then added a whippletree and two swingletrees. I have also modelled chains to link the collars of the leading horses together as well as chains from the collars of the wheel horses to the end of the pole shaft (which holds it up at the right angle). The picture taken from above shows this more clearly. 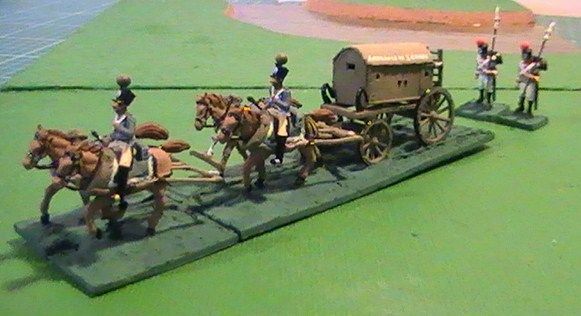 Following the ambulance are two infirmier, converted from Airfix marching artillerymen. 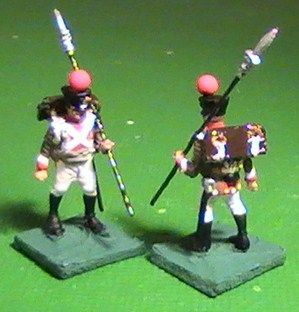 They carry a pike (which acts as a stretcher pole) over their shoulder (modelled from wire with a pike-head from an Airfix British sergeant), have one end of a stretcher mounted high on their pack and the canvas stretcher body around their waist (exactly as the Knotel print). There is a picture showing the detail.